convenient possibilities for extreme low positions with macro photography. The three legs are joined together in a moulded top of aluminium. In the centre of the top is a reversible tripod screw with the dimensions 1/4″ and 3/8″ respectively. The Stabil 3-section is available in two sizes whereof the smaller, the Suitcase Tripod, has a size and weight making it ideal for travelling and hiking. Thanks to the three sections of the models they have high flexibility for transport (minimum 0.65 m (small)) and for use (up to 1.69 m (large)). The tripod’s two upper sections are made of lacquered oak; the lowest section is manufactured from powder lacquered aluminium tubes which at the ends have the Stabil’s unique cup-shaped foot that gives excellent gripping in all angles and on all surfaces. The three legs are joined in a moulded top of aluminium. In the centre of the top is a reversible tripod screw with the dimensions 1/4″ and 3/8″. 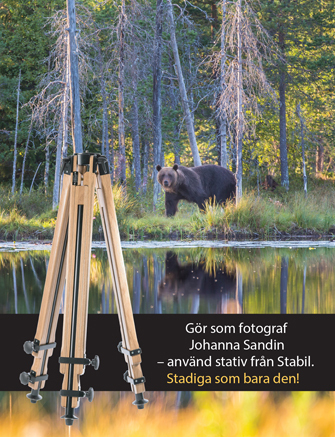 Stabil Speed is a two-section tripod with very good stability that has the special quality of very quick handling. The tripods upper part is of lacquered oak. The three legs are joined together in a moulded top of aluminium. In the centre of the top is a reversible tripod screw with the dimensions 1/4″ and 3/8″ respectively. The extension of the tripod legs are manufactured from powder-lacquered aluminium tubes which at the end has the Stabil’s unique cup-shaped foot, which gives excellent gripping qualities in all angles and on all surfaces. The Stabil Speeds are the tripods to use in the outdoors when you want speed, flexibility, sturdiness and comfort. The Stabil Speed is available in two sizes. Stabil Monopod is a sought after addition to our range of tripods. The monopod is available in two sizes and both have three sections. It folds out quickly and has a tilting integrated head for horizontal/vertical image alignment. The Stabil Monopod has a low weight and is easy to take along on a photographic tour. The monopod’s two upper sections are mad of lacquered oak, the lowest section of powder lacquered aluminium tubes. Centred on the head is a reversible screw with 1/4″ and 3/8″ dimensions respectively. The integrated head can be locked in any angle between horizontal and vertical.